Swim.com allows swimmers to track their workouts with a compatible swim device or smartwatch. Swim with the Swim.com app for Pebble and upload your workouts to Swim.com directly to Swim.com. Or swim with your Swim.com compatible Garmin, Finis or Poolmate watch and sync your workouts through Garmin Connect, Finis Streamline or Poolmate desktop software, respectively. NOTE: There is currently a bug in the Pebble firmware that can cause some users' workouts to fail to transfer from the Pebble watch. Pebble is working on resolving this issue. Swim.com allows you to utilize all the functionality of your swim watch, recording your distance, times and efficiency, and using them to track your progress over time. Compete with your friends and other local swimmers. Rise to the top by swimming workouts, improving and uploading and get rewarded by the hard work you put in. Whether you’re looking for a place to swim, a club to join, or to start your own club with your friends, Swim.com has the tools you need to find the pools and clubs you’re looking for. 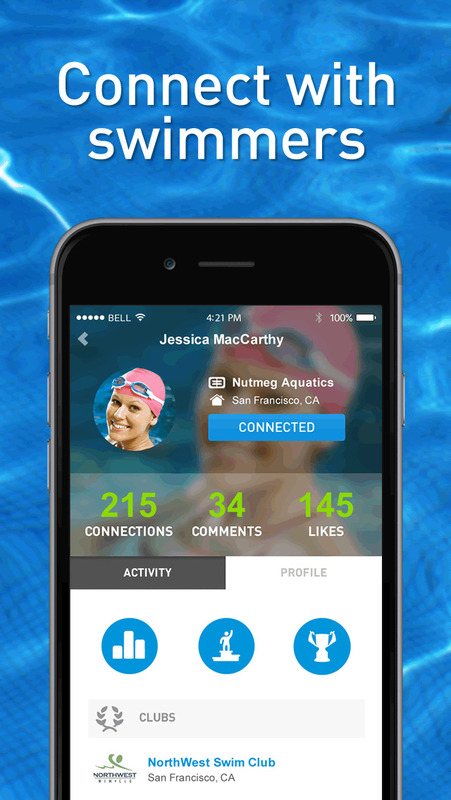 Connect with your friends and other local swimmers on Swim.com to motivate each other, compete and show off your swim training achievements. Swim.com and a smart swim watch make a powerful combination. Pace clocks and lap counters are great at telling you how you’re doing in your workout and swim watches can give you even more information about your swim. But how can you know whether you’re really improving workout-to-workout, week-after-week and month-to-month? Swim.com tracks all of your swimming workouts and gives you valueable tools to show your improvement. Whether your goal is to get faster or to be more fit, it’s vital to know where you are, where you’re going and where you’ve been. With Swim.com, you can compare your progress in variety of graphical and informational ways which allow you to stay on track to swimming success. Ever wonder who the fastest swimmer at your local pool is or which one of your friends is really putting in the most distance this week? On Swim.com, you can compare yourself against other swimmers on our unique Leaderboards. Leaderboards allow you to rank yourself against other swimmers on Swim.com. You can rank yourself at the pool you swim at, or in clubs that you and your friends or teammates create. You can further compare within your age group, gender and the type of swimmer you are. Leaderboards are kept for distance and for swim time over set distances, from 50 all the way up to 1500. Whether you’re just starting out and looking to improve, or the pro who wants to hold the top spot, Leaderboards can help. Game on! Swim.com has tens of thousands of pools and clubs around the world for you to find and swim at. Our system allows you to locate and browse pools near you, and to find the relevant information you’re looking for. Traveling? With Swim.com, it’s easy to find the local pools which are popular amongst lap swimmers, are the right size and length and are open to the public. Just moved? We can help you find a local club to join and swim with. Or, you can create a club for you and your friends to train and compete together. Swimming is an incredibly popular sport, but staring at a thin black line through several feet of water can be incredibly lonely. Whether you swim solo or with a team or club, Swim.com allows you to connect with other swimmers to share in the sport you love. Whether you need a training buddy at a local pool or a friend to compete with, Swim.com is a great way to connect with other swimmers to share in the swimming experience. Compare workouts with your teammates, share your first Lane Leader with a friend or congratulate other lap swimmers on a personal record. Swim.com encourages swimmers to engage and interact with each other, because together we all improve.